You don't have to be a #Girlboss or "lean in" to have a dream career and live a life you love. - How and when to say “no” – whether it’s a dream job that just isn’t the right cultural fit or a low salary proposal, as well as when to say “yes"
Carrie Kerpen is the co-founder and CEO of Likeable Media, a global content studio that was named Crain’s sixth Best Place to Work in NYC. She is the host of the hit podcast "All the Social Ladies" and a columnist for INC and Forbes. Carrie has been featured by The New York Times, CBS Early Show, ABC World News Tonight, FOX News, and CNBC’s On the Money. She has keynoted conferences in London, Las Vegas, Mexico City, and New York, among others. "An empowering career guide featuring bold advice from 50 high-profile women on how to succeed in work, leadership and life." --Barbara Corcoran, founder of Corcoran Real Estate and "shark" on ABC's emmy award winning "Shark Tank"
“What I like so much about [Work It] is its deliberate accessibility. 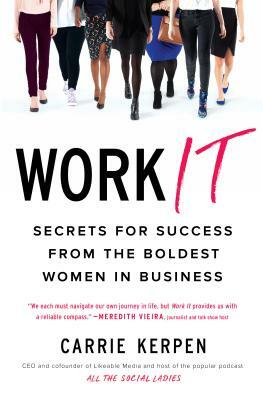 Work It will speak to those of you who aren't feeling the #Girlboss or "lean in" or "badass" bause personas that so many books tout currently. Still, the ‘secrets’ that make up the book still originate from some of the most successful or powerful women in business, including Kerpen herself.”--800 CEO Read, "Fall Favorites by and for Feminists"